'BLACKBURN' is set to release on DVD this August. Tombstone Entertainment will handle the release. 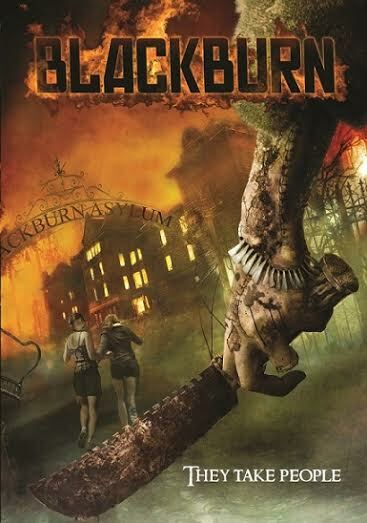 A 3Brane Entertainment production, 'BLACKBURN' involves a group of friends, trapped in an old mining town. From a script by Nastasha Baron and directed by Lauro Chartrand, this title stars: Lochlyn Munro (Poker Night), Jen and Sylvia Soska (“Hellevator”). Emilie Ullerup (A Little Bit Zombie), Sarah Lind (Wolf Cop) and Calum Worthy also star. All of these filmmakers have developed this hard R (restricted) horror feature, which now invites you to take a look at the official DVD artwork. The official DVD artwork reveals more of the film’s story. The Blackburn Asylum, long since closed, still haunts the local woods. Its residents, forced out by its closure, roam inside this broken down building. Promising to “take people” many of the deformed monsters can be seen, in this official artwork. And, more on 'BLACKBURN' will be revealed this Summer as the film nears its 2nd August 2016 release date.